What kind of fireproof clothing do you need according to your job? The type of fireproof clothing varies depending on the sector or the tasks to be performed. In any case, there are some trades in which the use of flame-retardant clothing is obligatory in most tasks. This is the case of firefighters and welders, whose clothing has a special specific pictogram and very specific legislation, included in the Spanish standard (UNE). Structural firefighters: UNE-EN 469:2006. This protective clothing for firefighters is used for firefighting and related activities such as rescues. Also for accidental splashes and possible splashes of liquid chemicals and flammable liquids. Forest firefighters: UNE-EN 15614:2007. This standard registers all the thermal requirements of these garments, such as flame propagation, radiant heat or resistance to heat. Reflective clothing for firefighters: UNE-EN 1486:2008. Reflective protective clothing for special fire-fighting work (very high levels of radiant, convective and contact heat). For example, in flammable gas and liquid fires. It is used for short periods of time, protects against contact with flames and reflects intense radiant heat in high-risk situations. Exposure to heat and/or flames that can result in burns from short-term contact with a flame or radiant heat from the electric arc used for welding. Brief electrical shock due to accidental contact with live conductors at voltages up to approximately 100 V (DC) under normal welding conditions. CLASS 1: protection against welding techniques and less dangerous situations, which produce lower levels of molten metal splashes and radiant heat. CLASS 2: protection against welding techniques and more dangerous situations, with more molten metal splashes and radiant heat. 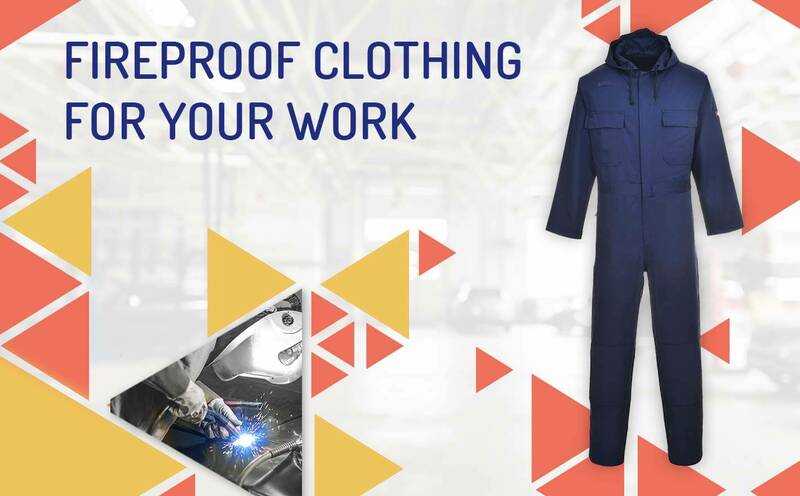 The standard for welding clothing and related processes is grouped into UNE-EN ISO 13668:2013 (general requirements) and UNE-EN ISO 11611:2015 (specific requirements). In cases where a suit is necessary, there are the options of a welder's suit or a two-piece suit, made up of trousers and jacket, with sufficient length to overlap with the top of the trousers. To protect the head, face, hands and feet can be used Individual Protective Equipment (PPE) extra. If you have any questions about the type of fireproof clothing needed for your job, don't hesitate to contact the Reysan team. We'll advise you on the best option!